The MPK249 comes equipped with 49 semi-weighted, full-size keys and a premium piano-style keybed for unprecedented response and natural feel. Each key is velocity-sensitive and outfitted with aftertouch for dynamic, expressive performances and recordings. In addition, onboard Octave Up and Down controls allow players to access the entire melodic range; play bass lines, piano harmony, solo leads and much more. MPK249 is armed with powerful production software--Ableton Live Lite and MPC Essentials--for out-of-the-box music creation. Ableton Live Lite is a fluid audio/MIDI environment that enables musicians and producers to spontaneously compose, record, remix, improvise, and edit musical ideas. MPC Essentials, a groove/beat production and sample-triggering software, can integrate directly into any DAW, such as Ableton Live Lite, or run standalone. 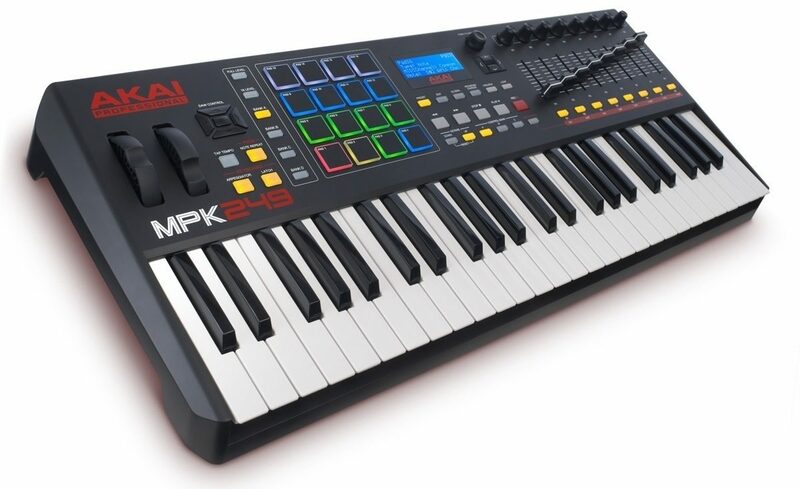 In addition, it extends the power of MPK249 by adding up to 8 pad banks and 4 samples and insert effects per pad. Two high-definition virtual synthesizers bring the best of synthesis technology to MPK249 users. Hybrid 3, by AIR Music Tech, is a versatile virtual synthesizer that combines the warmth of legendary analog synths with a full range of futuristic, digital manipulation capabilities. SONiVOX Twist, a spectral morphing synthesis virtual instrument, makes it easy to create serious sounds using simple controls. Together, these powerful instruments give MPK249 users professional music-creation tools that can jump start any project. - Dimensions: 29 x 12.25 x 3.38 in.